The game had two different releases: original ("Version 1") and enhanced ("Version 2"); See Version differences. Can be played online in your browser through the Internet Archive Software Library (progress can't be saved however). The original 1988 release ("Version 1") runs in 16 colors. The enhanced 1989 release ("Version 2") has moderately improved graphics and new character animations. It runs at a slightly higher resolution with more colors. 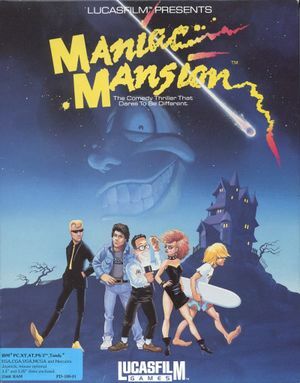 For the 2004 VGA fan remake, see Maniac Mansion Deluxe. In order to run the game on modern systems, you'll need to use DOSBox or ScummVM. The music in this game was composed for the Tandy 3-voice, which produced more advanced sound than the default PC speaker (beeper) found in most computers running DOS. To emulate this in DOSBox, set tandy=true under [speaker] in the configuration file. To emulate this in ScummVM, overwrite the global audio settings and set Music Device to IBM PCjr under the audio tab in the individual game options for Maniac Mansion. Sound can only be toggled.